A lifelong Johns Island resident, Jack Limehouse was born and raised in the produce/farming industries. 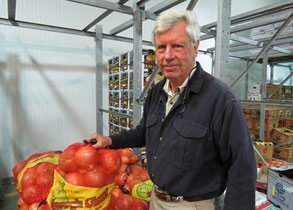 His father, H. B. Limehouse, started Limehouse Produce in the mid 40s and his second cousin Sidi has had a successful farming business for years. After graduating from the University of South Carolina, he came back to the Lowcountry, a place he loved and took over the business when his father passed in 1972. Along with his wife of 32 years, the couple has built Limehouse into one of the most successful produce companies around. Favorite Produce: Onions: Why not, they make you cry. Originally from England, Andrea Limehouse traveled the world as a young lady visiting places like Istanbul, India, Turkey and eventually South America. It was there where she worked on ranches in Bolivia and Brazil immersing herself in the culture and language. In the late 70s, she came to Charleston to visit friends and while here met Jack Limehouse. 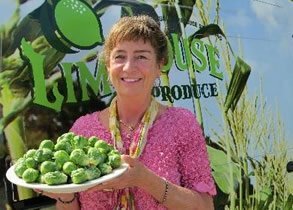 The two were married in 1980 and she has spent the last 30 years growing and developing Limehouse Produce with her husband into the successful, charitable business it is today. Favorite Produce: Brussels Sprouts: Andrea grew up 20 miles from the Brussels Sprouts capital in the world and loves eating them, especially covered in maple syrup. Weston Fennell moved from Washington, D.C., to Charleston in 2004 to pursue a life-long love of food and cooking. Having no professional experience, he knocked on the doors of some of Charleston’s most esteemed restaurants looking for any opportunity to work in the kitchen. Eventually, it was Frank Lee that gave him a chance to wash dishes for Maverick Southern Kitchens. Just three years later, he was hired as Mike Lata’s sous chef at FIG restaurant, where they won a James Beard award in 2009. What he valued most from his time in the kitchen was developing relationships with the farmers and fishermen that supply our food. Those relationships have been instrumental in his role as Lead Buyer for Limehouse Produce since he joined the company in 2010. He handles all product sourcing and serves as the primary go-between for chefs in search of local, seasonal and specialty items. Weston graduated from the University of Virginia in 2000 and worked in digital media (Los Angeles) and political advocacy (D.C.) before making a home in Charleston with his wife and children. 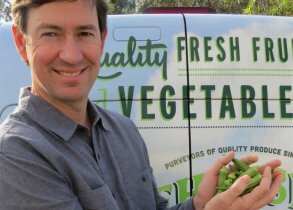 Favorite Produce: Artichoke: Weston has visited Castroville, Calif., where most of the world’s artichoke crop is grown, and loves the perfect simplicity of artichokes barigoule. A Wisconsin native, Brent Lukens moved to Charleston to attend Johnson & Wales University where he got an Associate’s degree in Hotel Management. He then worked for a variety of hotels and did everything from steward to front office manager. 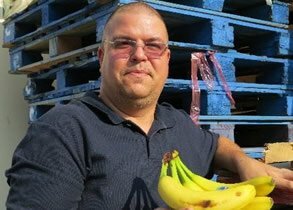 Limehouse Produce hired Lukens six years ago to serve as Logistics Manager and he is in charge of making sure the operations are managed and run flawlessly. He starts his day at 3:00am and does everything from routing the trucks, managing the receiving of products from suppliers, assisting with payroll, handling customer orders, credits and billing and setting up new business accounts. Lukens loves his schedule as he leaves most days by noon so he can hang with his two kids or do things he loves like cooking and playing pool. Favorite Produce: Bananas: It was easy to grab…now back to work! Ken Strange, a Charleston native, grew up in the produce industry at a very young age. His father, who worked for a company that helped finance local farmers and their farming equipment, would take Ken along to visit the customers. While at the farms, Ken would get to pick fresh red ripe Johns Island tomatoes. He then took these veggies and sell door to door in his neighborhood. By the time he was 12, he had over 15 regular customers. He graduated from Middleton High School and spent some time at both the College of Charleston and Trident Technical College before wanting to get back into the business world. It was a natural move when he joined Limehouse Produce at the age of 21 and he has been there ever since. In his role, he assists the team with sales, delivery, customer service and fleet management. Favorite Produce: Artisan Romaine: Because of its exceptional shelf life and the lettuces offer an unmatched quality that our customers can expect on a consistent basis. Lyle Passink has spent most of his life in the food supply industry. His family owned a distribution company in Jacksonville, FL where he spent much of his time working while growing up. After graduating from the University of Georgia with a degree in Marketing he decided to rejoin his family’s business and move to Savannah. After many roles of increasing responsibility, there was a need in the Charleston market which he was fortunate enough to fill. It didn’t take long before he fell in love with the city and decided to call it home. 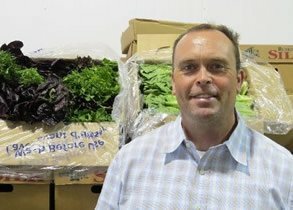 In 2011, he joined Limehouse Produce and has a strong appreciation for the company’s philosophy of quality and service. At Limehouse, Passink spends most of his day working to make sure customer needs are being met. Whether implementing contracts and compliance for national programs, developing new product lines, or finding ways to remove costs from the supply chain, Lyle is always looking for ways to add value to our customers. 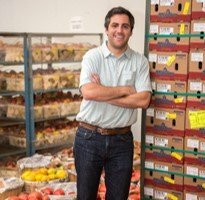 Favorite Produce: Tomatoes: Lyle worked the tomato conveyor belt line every summer at his family’s produce company and feels like he is always on the search for the perfect tomato. Chaz Green was born and raised in the small town of Farmville, VA. He eventually made his way to Charleston in 1993 to attend the College of Charleston. Although he graduated with a degree in Media Communications in 1997, he pursued an interest stemming from a summer job working on a clam farm. Green then spent the next 12 years raising and selling millions of clams from a small company on Folly Beach. This endeavor also led him into the Charleston-area kitchens and cultured relationships with many of the chef’s. 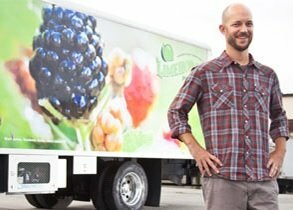 These relationships opened the doors to Limehouse Produce where Green now handles outside sales and customer service for the company. Favorite Produce: Beets: I have a sweet tooth and beets are the candy of vegetables. 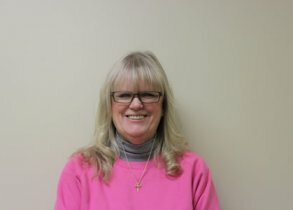 Debbie joined Limehouse Produce in 1985 after beginning her career at Southern Marine. In the years that have followed, she has been involved in many facets of the company’s operations, including specialty procurement, food safety coordination, logistics and transportation. In her current role managing night shift operations, she is responsible for creating a seamless transition between the night and day shifts, and for organizing the invoicing and selection of hundreds of customer orders each night. She is a member of the South Carolina Food Safety Council and is a Certified HAACP Officer. In her free time, there is nothing Debbie enjoys more than visiting the coast with her family. Favorite Produce: Green Peanuts; Growing up in Charleston these were a staple of my childhood and are a hallmark of Southern cuisine! 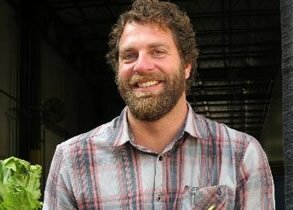 A North Carolina native, Jamie Vaughn was raised surrounded by farm land and fresh local produce. While attending college at East Carolina University, he cooked at several places including an upscale country club. Jamie worked under a trained chef and it was here he became interested in pursuing cooking as a career. Three weeks after graduating with a BA in English, he moved to Charleston to attend Johnson & Wales University. He had an internships at the Ritz-Carlton St. Thomas and a French/Spanish restaurant in Washington, DC before moving to Wilmington, NC to open Circa 1922. He was there sous chef for four years and chef for six months before moving back to Charleston. After cooking at a few restaurants, Jamie wanted a change of pace and took a job as Chef Team Leader at Whole Foods Market in Mt. Pleasant. He was there for six years before being named Produce Team Leader for two years. He moved to Charlotte to work at Whole Foods Market for a year and a half. During that time, he decided he wanted to move back to Charleston. He was hired as a produce buyer at Limehouse Produce in September 2015. Favorite Produce: Okra because it is so versatile and has great flavor. You can roast, fry, sauté it. A Texas native, Maria Jimenez moved around as a child until she eventually settled in Nebraska. She taught ESL and also was a staffing coordinator at a staffing firm for several years. After a friend recommended she move to Charleston, she relocated in 2009. She worked as a paralegal for three years and specialized in immigration laws. She then worked for attorney George Sink as a paralegal for three more years. In 2014, she was hired to work at Limehouse Produce and is the rock star dynamo that manages about 200 different tasks at the front desk. 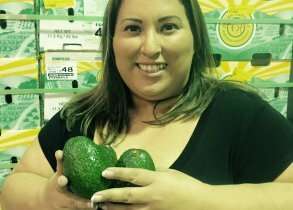 Favorite Produce: Avocado—her mom used to take them to the beach and they would eat avocado sandwiches. Ever since that, she has loved eating and cooking with them.